As it is almost Thanksgiving, I feel as though I must offer a few recipes for the season. I still cook the entire feast, even though the past few years it's only been the two of us at dinner. Last year, I made the whole meal healthy - cutting out a lot of fat, sugar, and the bad stuff, but keeping all the flavors intact. It was one of my finer meals of the year. The left-overs were spectacular. Which is the real reason why I even cook the entire meal. I love left-overs, the turkey sandwiches with coleslaw and dressing. Pumpkin pie with a dollop of cranberry sauce as a sweet/sour accompaniment; reheated and re-crisped stuffing. It's all good to me for about 3 more days. By Monday, there's usually little remaining, just in the nick of time, as I'm about done with the carb overload and the stale taste of 3-4 days old turkey. 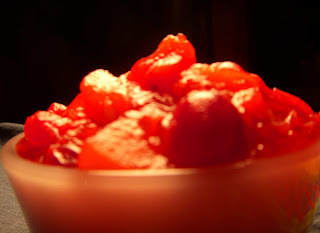 As for today's recipe offering, here's my version of a cranberry compote or sauce. Cranberry sauce is so easy to make, almost as easy as opening that can of jellied ring-lined sauce that tastes of tin. MMM, Yum! I like the Williams-Sonoma version of Apple-Orange Cranberry Relish, and I have a nice recipe for Cranberry and Ginger Chutney, but I wanted something homemade a bit simpler for my holiday table this year. 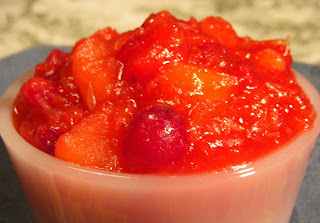 Herewith I give you my Apple-Orange Gingered Cranberry Compote - a sweet and sour study in color and taste sensations. In a medium, non-reactive sauce pot, add the cut apples and the apple cider and bring to a boil over medium heat. Reduce heat to a simmer and stir in the orange zest, orange segments and orange juice. Add in the sugar and the cranberries and stir to combine. Raise heat and bring the mixture to a boil. Stir the mixture and keep a close watch on the mixture as the cranberries begin to pop and cook. Once the cranberries begin to cook and break down, reduce the heat to a simmer. Add in the minced candied ginger pieces. Take the mixture off the heat and allow to cool in the pot. The mixture should thicken and firm up as the natural fruit pectin's in the apples and cranberries will cause it to gel. Refrigerate and cool completely. Store in a tightly covered container for up to 1 week. Makes about 4 cups of compote.